The Washington Capitals made history last season as they captured their first Stanley Cup title in the franchise’s existence. 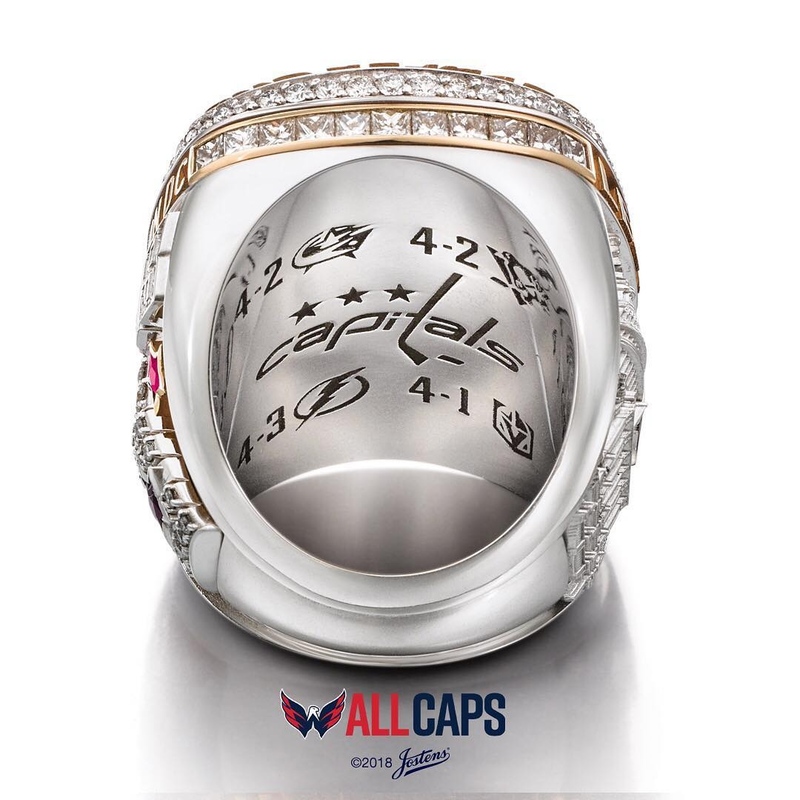 On Monday afternoon, the Capitals’ players and staff members names were officially added to the Stanley Cup and that wasn’t the only big moment of the day for the franchise as the official championship rings were revealed shortly after. 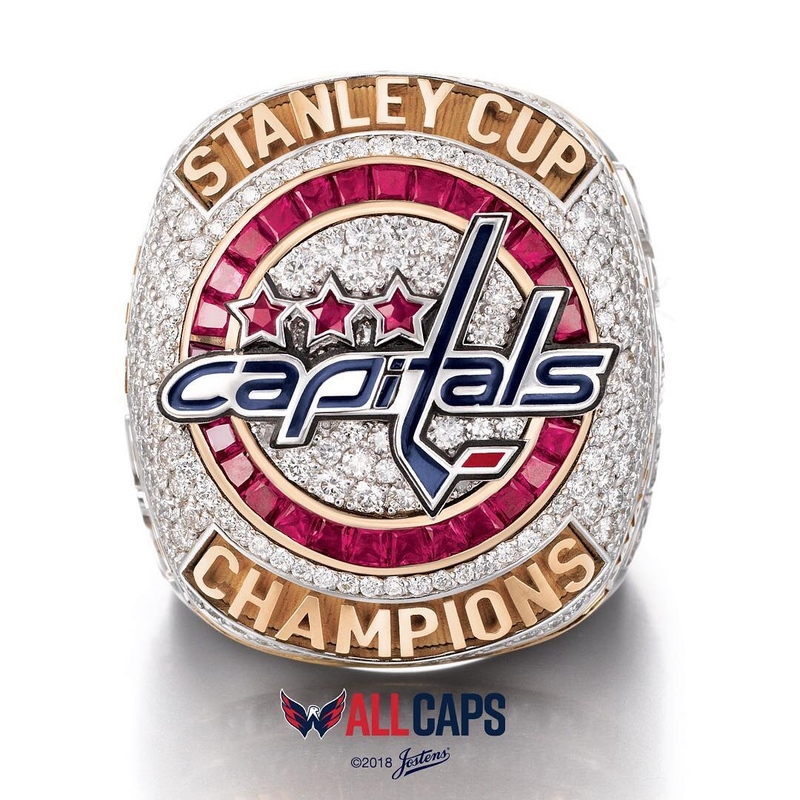 Designed by Jostens, the Capitals’ first-ever Stanley Cup ring is made of 14-karat white and yellow gold expertly set with diamonds, genuine rubies, and genuine sapphire. It’s made up of 230 round diamonds and 22 princess cut diamonds, for a carat weight of 5.5. There are also 28 custom taper-cut rubies and seven custom-cut star-shaped rubies, totaling 4.6 carats, while a star-shaped sapphire that weighs .10 carats bring the stone weight to 10.2 carats. 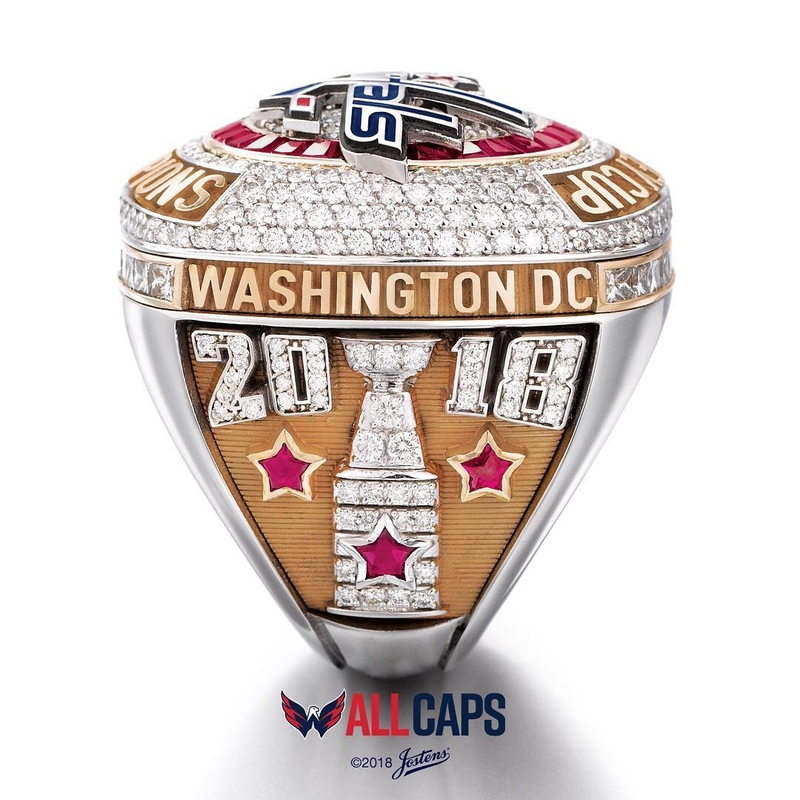 The top of the ring features a Capitals logo made from red and blue enamel and is surrounded by 27 pavé-set diamonds, which is encircled by 28 custom taper-cut rubies, while the three star-shaped rubies above the logo are inspired by the Washington, DC flag. There are also an additional 157 diamonds that create a waterfall effect on the side of the top of the ring, while the words “STANLEY CUP CHAMPIONS” are in yellow gold. 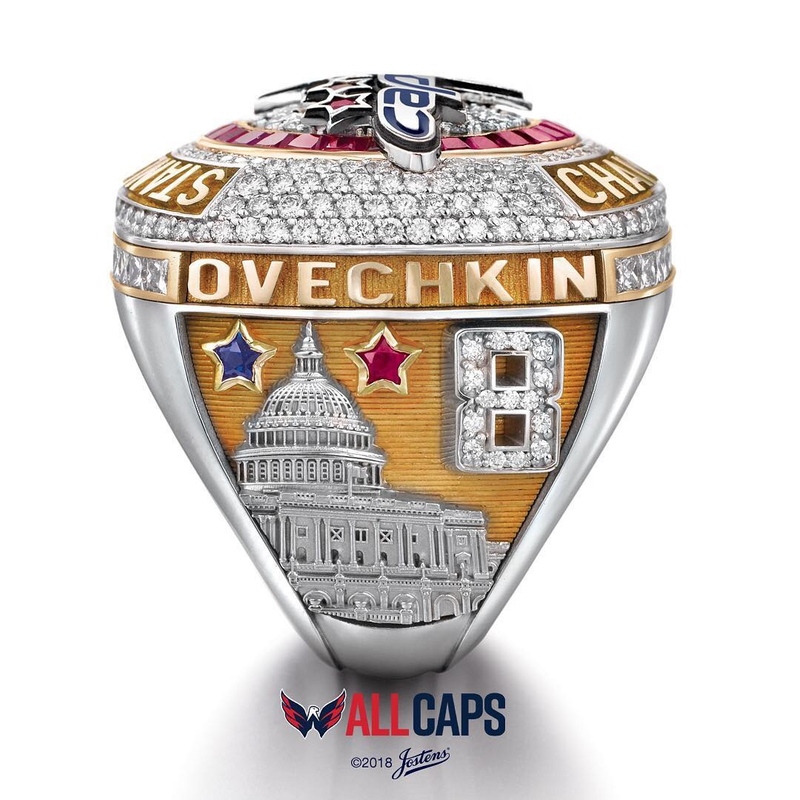 The left side of the ring might be the nicest, as it contains the player’s name above the Capitol building, which is created entirely from 14-karat white gold, and has the player’s numbers to the right with stones ranging from 7 to 18 diamonds. The opposite side of the ring includes the 2018 in 26 diamonds, which rests above the Stanley Cup created in white gold and set with 20 diamonds and one star-shaped ruby, representing the team’s first Stanley Cup title. The two additional star-shaped rubies represent the team’s two Eastern Conference Championships, while the words “WASHINGTON DC” pay homage to the home base of the franchise. Inside the ring you’ll find the Capitals’ logo surrounddd by the logos and series scores from their journey. This might be the nicest championship ring we’ve ever seen.